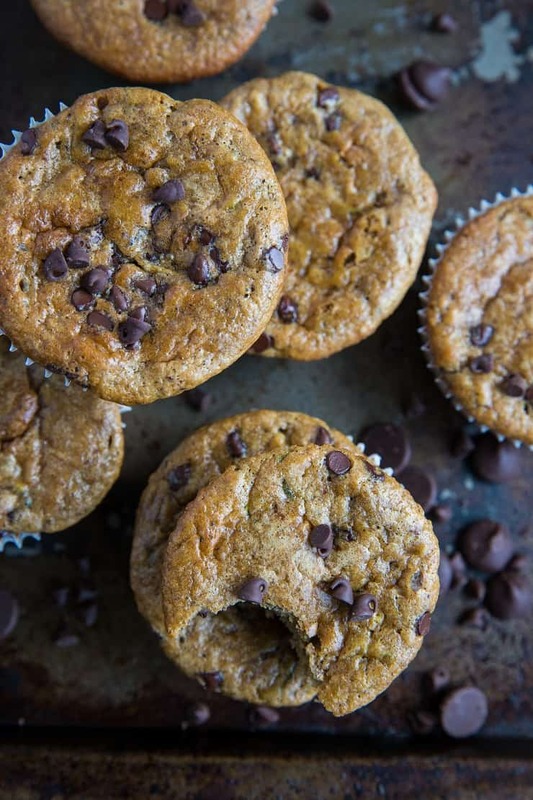 Grain-free, dairy-free, refined sugar-free paleo chocolate chip zucchini muffins – these healthier muffins are prepared easily in your blender and turn out so nice and fluffy! What zucchini-infused foods have you been whipping up this summer? I’ve been eating quite my share! I’ve been roasting it and sauteeing it to add to every meal – my morning scramble or frittata, and my lunch and dinner bowls. And, as you can see, I’ve been baking up paleo chocolate chip zucchini muffins as well. Zucchini bread was always one of my favorites as a kid. I have fond memories of the homemade zucchini bread my mom used to make, and loved eating a thick slice warmed up with a hefty dollop of butter. So I took that comforting concept and formed it into a grain-free muffin version…plus added dark chocolate chips, because: YOLO. I even go the extra mile to sprinkle the muffins with sea salt, because to me, the salty-sweet combo is pure heaven on earth for the tastebuds. 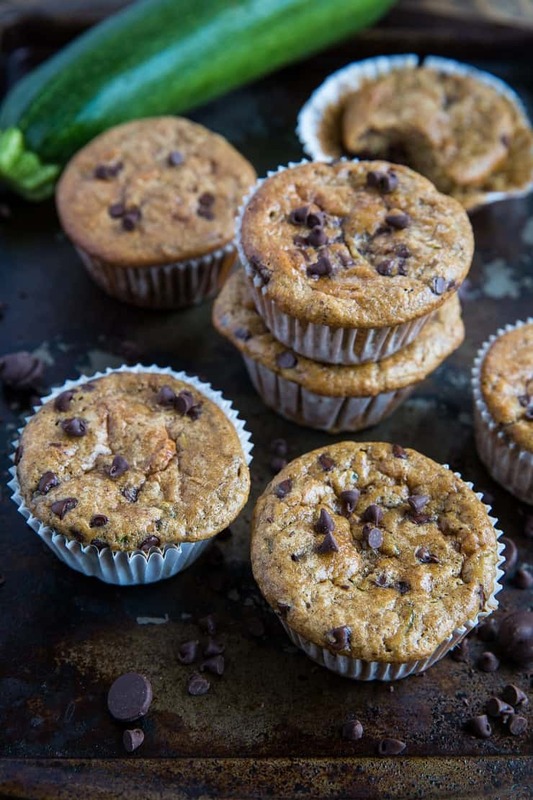 All you do is whiz everything except the zucchini and chocolate chips up in a blender to create the muffin batter, then fold in the zucchini and chocolate chips. Bake up the muffins, and enjoy! 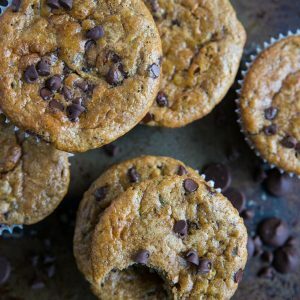 These paleo chocolate chip zucchini muffins are lower in sugar than your standard muff, and are made with all whole food ingredients. They’re sweetened with a ripe banana and some pure maple syrup (or honey), resulting in what I consider to be a perfectly sweet muffin. I use almond flour for these muffins, but you can also use hazelnut flour. I haven’t tested the recipe using coconut flour yet, so I can’t say what the coconut flour conversion is yet. If you aren’t a fan of chocolate, no worries! You can absolutely skip the chocolate and simply make regular zucchini muffins. ^See that chunk of banana in the bottom left corner of the muffin? That’s what dreams are made of right there. Use your favorite dark chocolate chips or chop up a paleo chocolate bar for the chocolate portion of this recipe. 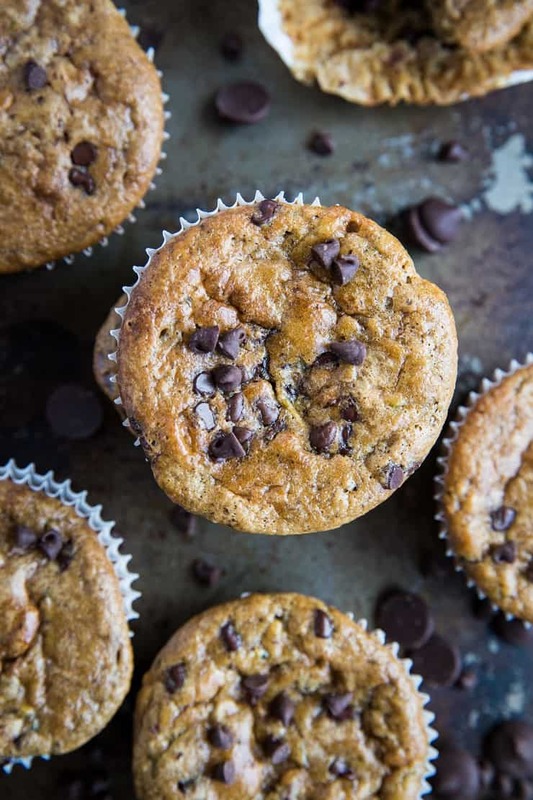 Do note: if you’re using muffin papers for these muffins, you’ll need to allow them to cool for at least one hour before attempting to peel the papers off, lest the muffin stick to the paper, the paper stick to the muffin, and you lose half your treat. 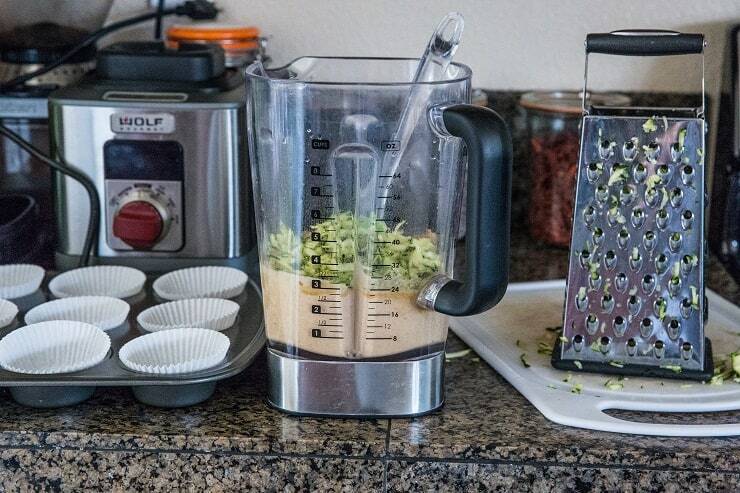 You can remedy this by simply spraying the pan with cooking spray and going paperless…you will still need to wait a while before releasing the muffins from the tray. I wait an hour, then use a pairing knife to run between the tray and the muffins to pop them out. Preheat the oven to 350 degrees F and line a muffin tray with muffin papers (or spray with cooking spray). Add all ingredients except grated zucchini and chocolate to a blender. Blend until completely smooth. Fold in the grated zucchini and chocolate chunks/chips. Spoon the batter into the prepared muffin tray, filling the holes 3/4 of the way up with batter. Bake on the center rack of the oven 30 to 40 minutes, or until muffin tops are golden-brown and muffins have baked through. Allow muffins to sit at least one hour before removing the papers to consume (note: if you try peeling off the papers too early, they will stick to the muffins). It’s such a nice muff! 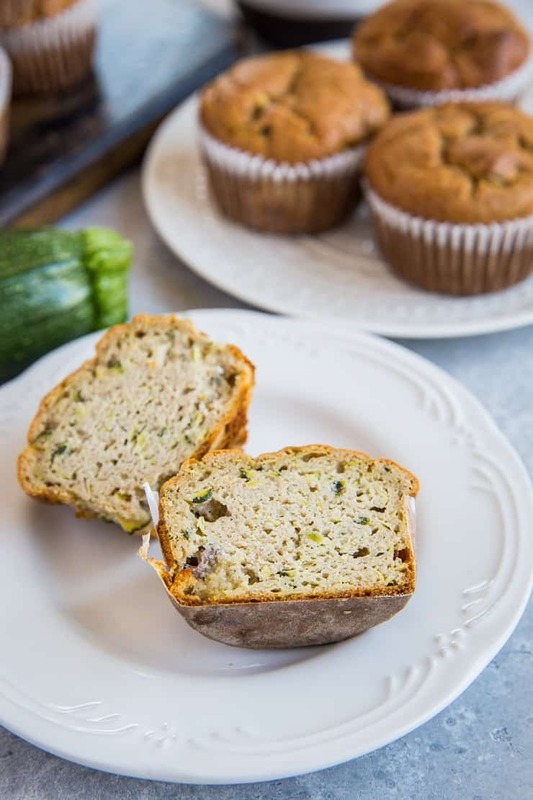 I love zucchini muffins! I need all the zucchini recipes I can get at this time of year! A delicious variation on baked oatmeal, this Amish-style apple and cinnamon baked oatmeal is so easy and delicious (and can be made the night before! ).